Gary Ablett has hit the wall. But before a Cat fans freak-out on finals eve, Double Take should clarify that in this case The Little Master has hit the wall in the artistic sense, rather than the physical. And what other place for Gaz to feature in a six-foot mural than at a gym! 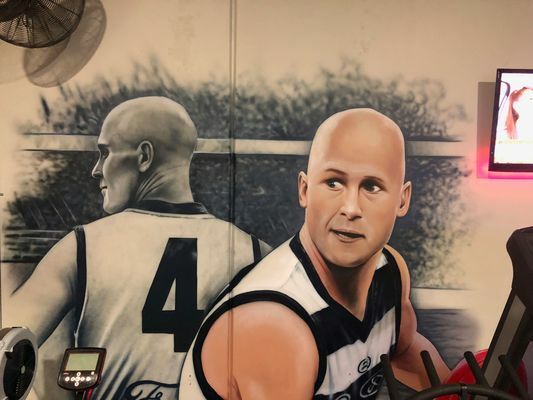 “Gary being a Geelong icon and a great inspiration to many footballers and Geelong supporters, I thought he’d be a great addition to our wall,” explains Tony Harvey, the owner of Grovedale’s HRVfitness. Hopefully Tony can recommission artist Ian Lowe in October for an update with a premiership medal around Gazza’s neck! Further on local arts, Geelong’s council is threatening to unleash a sensory overload at the next Geelong After Dark. The council this week called for expressions of interest from artists interested in participating in next year’s event, running under the theme Heighten Your Senses. Apparently the idea is to go some way beyond the usual laneway murals or projections on City Hall. All five senses, even “intuition or ESP”, should be explored through 2019’s installations, council suggested. Hmm. Sight and sound are fair game for art but Double Take’s intuition is that council might be pushing its luck with the other senses, particularly smell. For the sake of a forewarning, hopefully the catalogue for next year’s event comes out in a scratch-and-sniff format! Fans of all-brothers children’s band The Mik Maks will be happy to learn of some good news for the popular Geelong group after the tragic passing of member Dean McInnes earlier this year. 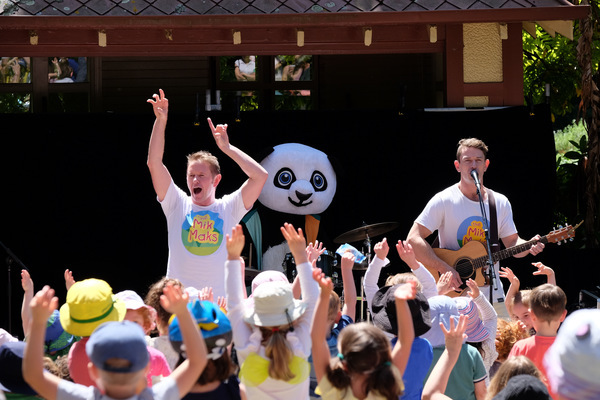 The band won best live act at the What’s On 4 Kids Gala Awards in Brisbane last week, with the boys getting the nod after an independent judging process and community voting. The band’s remaining McInnes brothers, Brian, Joel and Al, have since released a new single, We Brush Our Teeth, ahead of a national tour starting this month. “This year has been incredibly tough, the absolute worst,” Al said. “But even when you’re feeling absolutely gutted you’re just got to keep putting one foot in front of the other. And that’s what we’ve done; we keep making music. Double Take urges fans of The Mik Maks to also put one foot in front of the other and attend the band’s 1pm show at Geelong West Town Hall on 24 September.